It’s a hard act to follow your father’s footsteps in music. It’s about a million times harder when your dad happens to be John Lennon. Eight years ago Sean Lennon’s debut, Into the Sun, was released. It was hardly a Sgt Pepper, but then again, there’s not many album that are. 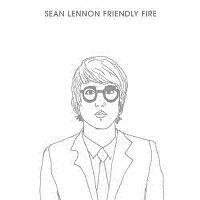 Now, eight years on, Sean Lennon is back for a third time with Friendly Fire. If Elliot Smith had decided to ditch recording Miss Misery for Good Will Hunting, and turned to writing a song for a James Bond film, Friendly Fire’s opening song ‘Dead Meat’ would sound pretty similar. Although the thought of that happening is scary, the result is pretty damn good. Dead Meat just has a presence. When you first hear the spine chilling intro on the piano, you know it’s something special. Although the rest of the album never reaches the same level as Dead Meat it gets close. In songs like Wait for Me you can really hear John’s vocals living on in Sean. Headlights is also a great song. It’s unpredictable tune and simple rhythm gives a feel of what Kurt Cobain and Marc Bolan could have done if they’d ever written a song together. On Again, Off Again is another beautifully interesting song that somehow puts a smile on your face. You can also tell that Sean has been listening to some good music. Elliot Smith, T-Rex, Radiohead, The Beach Boys and, naturally, The Beatles are all clear influence shown on the album. On the down side, parts of the album are incredibly cheesy. The intro to Tomorrow almost makes you want to cringe with its opening line, ‘I promised to stop loving you tomorrow.’ Sean’s cover of Marc Bolan’s Would I be the One is a poor attempt and also really lets the album down. Also, after a few tracks you know that eventually, Sean’s voice is going to drive you crazy. The title track is also another weak song. It doesn’t really leap out from the album, there’s nothing interesting about it. So although Friendly Fire has some great tunes, it’s let down at points by songs we heard a million times before. I’m sure Sean would still be signed if it weren’t for his dad, but he’d be nowhere near as big.